Woah! The holiday's sure did creep up this year, as did our recent snowfall and subsequent freezing rain! With the current pace of the holiday's rushing by I sure hope you've all decided on your New Year's Eve plans and outfits because as soon as the christmas countdown ends, the countdown to the midnight ball drop starts! Today I'm sharing a holiday cocktail recipe for gin lovers featuring Oregon-made Genesis Organic Juice. Genesis Organic Juice has quickly become one of my go-to items because it is raw and it's never heated, instead it's pressurized using a high pressure process (hpp) making the juice safe to sell and consume while preserving flavor, color and nutrition. Since the holidays are here, as are the numerous office treats and holiday parties why not give yourself a little nutritional boost in your holiday punch... here's an easy punch using Genesis Organic Juice in ginger lemonade and pacific northwest apple. 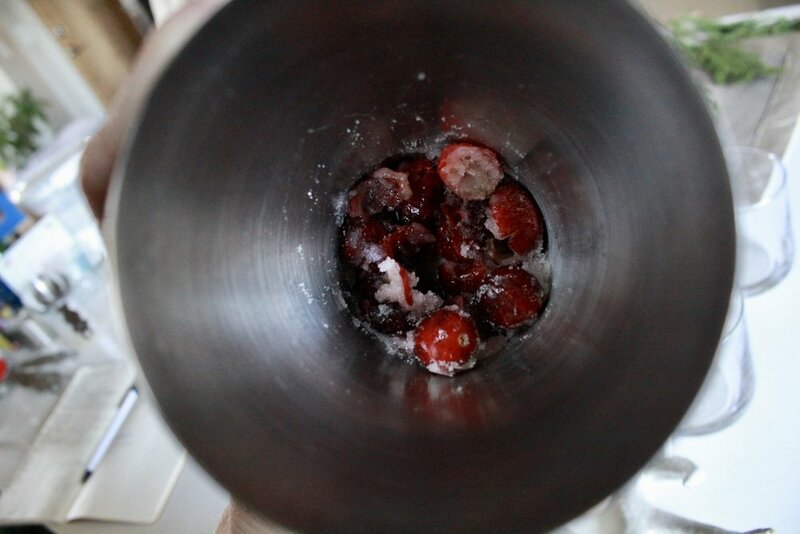 Place cranberries and sugar into a shaker and muddle. Place Genesis Ginger Lemonade, Genesis PNW Apple, ginger beer, gin and cranberry sugar mixture into a large pitcher and stir; refrigerate until ready to serve. divide among four glasses, serve over ice.